Abstract: Maddie is a young to middle aged Mare with a history of sacroiliac (SI)/pelvic pain. She became lame in the winter of last year in her hind limbs. It was determined she had SI pain. Since then she has been turned out on pasture rest for the last 6 months as per her veterinarian. 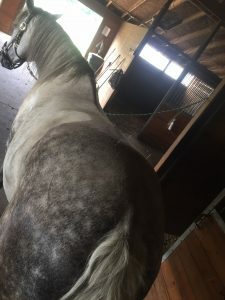 Our goal for her is to try to reduce areas of tenderness and pain, hopefully helping her become comfortable with the overall goal that she be relaxed and non-painful under saddle as her owner attempts to start riding her again. Her owner is planning to have her reevaluated at the end of the summer by her regular veterinarian to see if she is ready to start working at that point. At the end of four treatments, I do believe we did make a positive impact, though it was still somewhat questionable as to how much. While Maddie did seem to move more freely at the trot, and was more willing to move forward, her canter still did not seem to be quite normal yet. The best way to describe it is that there seems to be less reach underneath her with her hind legs and a stiffness, as well as perhaps a bit of hesitation with her gait. It is difficult to say if this is due to ongoing pain or because she has not been worked/cantered in some months and she has a general decrease in flexibility. History: Maddie is an ~ 10 years old Percheron/Thoroughbred cross Mare who presented last Christmas with the chief complaint of being lame in the hind legs. She is normally a dressage horse, who when being worked, was ridden on average 4 times a week (by both her owner and other people at times). It was determined that the pain was coming from her SI joint and it was recommended to have her SI joints injected. Her owner was unsure of going through with the injections. Over time a second opinion was sought and 6 months of pasture rest was recommended to see how she would respond. She has since been on 24/7 pasture rest. She is not on any medications other than regular deworming. At this time, she is not getting any regular treatments, though in the past she has had monthly chiropractic adjustments that did seem to help per her owner. She has no other significant history of lameness or illness. Physical Examination (PE) and Clinical Assessments: Patient appears to be comfortable standing, walking, and trotting. 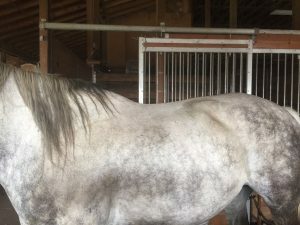 She is a bit slow/possibly stiff in the hind end, however her owner states that she has always been a bit lazy in general, especially with her hind end. No neurologic abnormalities noted. Myofascial palpation revealed tense caudal and dorsal cervical muscles. When extending her shoulders, there was mild discomfort (left more than the right). Otherwise no discomfort was noted on manipulation or palpation of forelimbs. Somewhat reduced motion of the spine on the ‘flick’ test, as well as tail rocking on both sides was noted. No response to the wither walk test and gator test was normal for both front limbs. On testing the lumbosacral joint (pulling cranially on BL 26) she was definitely tender. On the right side, she had a reduced response with little motion. On the left side, she buckled some. When applying pressure to BL 27 to test the SI joint, she buckled on the right side, and pulled away from the pressure on the left. She did not relax her SI joint at all when doing hind leg circles. She did not show any response to squeezing her tuber coxae, however she is a rather large horse, and this was difficult for me to do. Taut bands were noted in her epaxial muscles traveling down both bladder lines in some areas. She seemed unwilling to lift her spine on the lift test. Pain/sensitivity of lumbosacral area/SI joint – arthritis/joint dysfunction of the SI joint, possible IVDD, arthritis, kissing spines of lumbosacral area. Reduced motion of spine – arthritis, kissing spines, muscle tension/compensation for pelvic pain. Pain/sensitivity of cervical muscles – likely compensation for pain in hind end. Medical decision making: As Maddie has a sore pelvic region, with suspected both lumbosacral and SI pain, our treatments will focus on reducing the pain in this region both locally and centrally. In addition, we will want to pay attention to her rather tense cervical muscles as she is likely compensating for her hind end. As we begin to acupuncture her, we will want to continue to re-evaluate her front end and neck for strain patterns. As I suspect she is quite stoic, it may be difficult to determine what areas in her front end are most painful as even in the hind end, I suspect she is more painful than she shows on physical exam. First treatment – 7/7/18 – Maddie has never had acupuncture before, so we decided to start with calming and therapeutic points LI 16, GB 21 bilaterally just to see how she handles this before needling her more painful areas. As she has some very tense bands around GB 21 especially, this was a good choice. Purple Seirin (0.25mm X 30mm) needles were used in a slow tubed insertion. Dry needling and massage were our only techniques used today. Maddie did seem to notice the needles, and though insertion went well, she began to twitch and shook her head shortly after placement, dislodging all of our needles. At this point, it was determined that massage might be a better start. I was concerned that if she was noticing the needles that much in an area that is less painful than her pelvic region, she would not do well with needling of that area yet. Maddie was massaged for about 30 minutes on both sides of her body. Muscle spindle cell work was done on any taut muscles, especially along her back. She appeared to enjoy the massage of her neck and back the most. She did seem sensitive when massaging her pelvic region/gluteal muscles at times (though these muscles did not palpate tense). Tail rocking was done, to the point that Maddie would tolerate to help mobilize her spine. Second treatment – 7/21/18 – Maddie’s PE was similar to last time. Today we tried a tubeless, slow insertion that appeared to be much better tolerated allowing us to try more points. We also used fly spray only on her legs to help with the stomping and twitching she was doing that made it difficult to determine if the needles were bothering her or if it was the flies. Points selected were: LI 16, BL 25, BL 26 all bilaterally, and BaiHui. Purple Seirin (0.25mm X 30mm) needles were used. Dry needling and massage were our only techniques today. Rationale/goals of needle selection: LI 16 – calming point, and to treat local tension in her neck. BaiHui – autonomic point, calming point, and to treat lumbosacral/pelvic pain through neuromodulation of the spinal cord locally and centrally. BL 25 – help treat lower back pain by neuromodulating the spinal cord at the level of her lumbar spine to treat pain locally and centrally; it was also chosen as a point to try to determine how she would feel about having her lower back/pelvis needled. BL 26 – inserted last – Maddie did really feel these points, and it was determined these would be the last needles for the day – chosen to help neuromodulate the spinal cord at the level of the lumbar spine/pelvic region to treat pain locally and centrally. Needles were left in place for about 5 minutes. Maddie was massaged afterwards for about 30 minutes total on both sides of her body. Again, she enjoyed this massage, especially of her neck and back up to her lumbar spine. She seemed less fond of having her pelvic area massaged. Tail rocking was done on both sides to help mobilize her spine. It was noted that Maddie did stand with her hip/SI area relaxed on her own, which wasn’t something noted on her first treatment. Third treatment – 8/5/18 – Maddie’s PE was mildly improved from last time, although she was not as much in the mood for touch/massage today. She did however tolerate her acupuncture very well. Points selected include LI 16, BL 25, BL 27 all bilaterally, BaiHui, and BL 40 on the left only. Purple Seirin (0.25mm X 30mm) needles were used. Dry needling and massage were our only techniques today. Rationale/goals of needle selection: LI 16, BL 25, BaiHui – all similar reasons to last treatment. BL 27 – help treat lower back pain and neuromodulate the spinal cord at the level of her lumbar spine to treat pain locally and centrally; as this is a very sensitive area she did feel these needles a bit. BL 40 – ‘Master point’ for lower back pain; insertion was very well tolerated however she noticed this needle right away and it seemed to be bothering her so I removed it after only 30 seconds or so and decided to stop adding needles to our treatment as she appeared to have had enough stimulation at that point. Other needles were left in for about 10 minutes. Maddie did noticeably relax into our treatment until adding BL 40, with several yawns, half -closed eyes, and relaxing her hip/SI joint on her own again. Massage was done as tolerated but only for about 15 minutes. No tail rocking was performed today. Maddie just seemed to be done today a little sooner than previous treatments. I’m not sure if she was just feeling too stimulated, if it was the heat (very hot/humid morning), or if the barn crew doing their morning activities was a bit more distracting today. Note: My goal is to eventually needle BL 26, BL 27 and BaiHui which are all great points for lumbosacral/pelvic/SI pain, but as BL 26 and BL 27 are both so sensitive I continued trying to sneak up on it at each treatment. I am also hoping she will get more used to the needling of distal points. As she gets more used to needling I would like to add in some points along her neck and other BL points along her back as she seems to enjoy her massage in these areas the most and has noticeable taut bands. Fourth treatment: 8/19/18 – Today Maddie was feeling cooler and relaxed. She tolerated her acupuncture very well today. Points selected include LI 16 on the right only, BL 25, BL 26, BL 27 all bilaterally, and BaiHui. Purple Seirin (0.25mm X 30mm) needles were used. Dry needling and massage were our only techniques today. Rationale/goals of needle selection: all points have been used previously for similar reasons/goals. BL 27 today on the left did seem to be particularly sensitive and was the last needle to be placed. As these points seemed to give her enough stimulation, I did not attempt BL 40 today. Massage was done on both sides while needles were in place for about 15 minutes. No tail rocking was done today as she just did not seem to be into it again. Maddie seemed to do well today. Maddie was a great patient who at first wasn’t so sure about acupuncture, but I think came to relax during her treatments and tolerate them well. At our last visit, we trotted her around after her treatment and she definitely seemed to be moving more freely/animatedly at the trot and was offering the canter much more than in her first video session and seemed to be feeling her oats more than is usual for her (though it is not unheard of for Maddie to have days where she is feeling friskier). It is hard to say if she was feeling good after her treatments and just trying to work some kinks out, or we caught her on a particularly good day (it was less humid and hot compared to the day we first videotaped her). Her canter was still not quite a normal canter, although unfortunately we do not have a great video of her canter in the videos prior to treatment (partially because it is hard to even get her to trot and move in a forward fashion at times as she tends to be a ‘lazy’ horse). As described earlier it just appears that she has less reach and a stiffness/hesitation with her hind legs during this gait. Again, we do not know if this is because she still has ongoing pain, or she is simply stiff from not being cantered or worked in some time. I do think that because she seemed pretty willing to offer the canter on her own, especially going to the right, that this is more due to general stiffness rather than pain, though due to the chronic nature of her disease it would not be surprising that she deals with some chronic pain. Maddie is still set to be re-evaluated by her regular veterinarian later this summer, and it will be interesting to see what she thinks of her movement and progress. As she is still not being ridden, it is difficult to determine what effect we did have. I do believe though that some of the reason she seemed to be feeling good after her fourth treatment is because of our acupuncture. Her physical exam did not seem to change too much and her pelvic/sacral points do continue to be reactive or tender when needled, so I suspect she still has some pain, and would like to keep treating her in the future. This is to be expected however to some extent given the chronic nature of her disease. I would be interested to see how she would respond to electroacupuncture, trying to get more distal points in (maybe even ting points) and try for more cervical and BL points to treat the tension in her neck and back. LI 16 didn’t seem to be a calming point for her and she almost seemed to be more irritated by it as if it were a fly. For this reason, I tended to focus more on her pelvic points, which were still tender, but seemed to be more relaxing for her once needles were in place. I wonder if I am being too hesitant with my technique and would see better results if I try to be more aggressive, but I feel my points are well chosen and are in line with what my patient seems to tolerate/enjoy. I hope to continue treating and seeing Maddie in the future after the baby comes. Zhen Ci Yan Jiu. 2016 Apr;41(2):169-74. Clinical Therapeutic Effect of Oblique Needling with Tuina in Relieving Sacroiliac Joint Injury. Kuang JY, Li YX, HeYF, Gan L, Wang AM, Tang SH, Lu FY, Yang LJ, Cat XL, Quan JL. Zhongguo Zhen Jiu. 2016 Apr;36(4):359-63. Sacroiliac Joint Injury Treated with Oblique Insertion at Anatomical Points: A Randomized Controlled Trial. Kuang J, Li Y, He Y, Gan L, Wang A, Chen Y, Li X, Guo L, Tang R.
Biomedica. 2017 Jun 2;38(0):54-60. Effectiveness of Low Back Pain Treatment with Acupuncture. Montes LA, Valenzuela MJ.